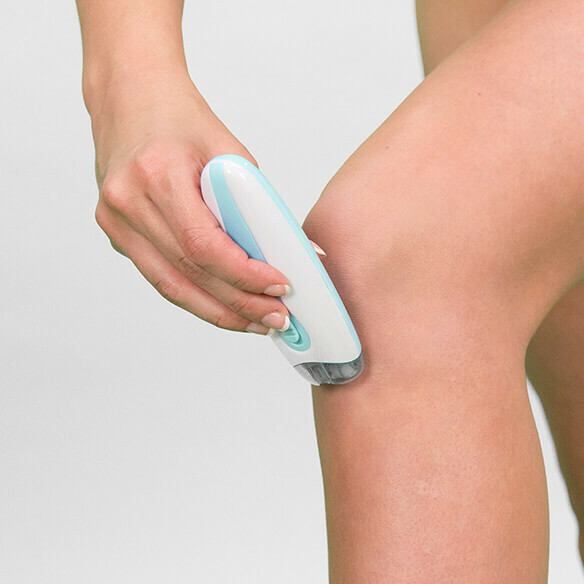 Gently remove unwanted hair without painful waxing or endless shaving with EPI Smooth™ Hair Remover with LED Light. To use, hold EPI Smooth™ at a 90-degree angle on the area in which hair is being removed. Move in a small circular motion across skin surface. No need to apply pressure. To insert batteries: Remove battery cover from back of the EPI Smooth™. Insert batteries with correct polarity. Replace cover over batteries once inserted. Once batteries have been correctly installed, slide button up to the ON position. Hold EPI Smooth™ at a 90⁰ angle on the area in which hair is being removed. Move EPI Smooth™ in a small circular motion across the skins surface. Note: There is no need to apply pressure. Use integrated light for guidance to see fine hairs. Do not wet or submerge in water.